Remember that game we played in the Brazil chapter of Walk Out Walk On with the Warriors Without Weapons? You know the one: the Oasis Game. The Oasis Game is a 2-4 day event that invites a community to come together to identify a shared need, co-create a plan for fulfilling it and cooperatively realize the dream with a spirit of joy and playfulness. The goal is to awaken a creative, cooperative spirit in community members, strengthening relationships and cultivating a sense of opportunity and responsibility to take care of their neighborhood and each other. Since Elos created the process more than ten years ago, Oases have started popping up all over the world. Oasis Games have now been hosted in more than 15 countries. 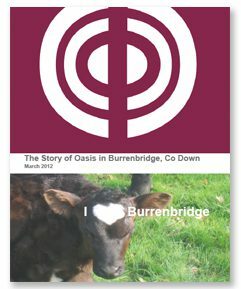 The most recent Oasis Game was hosted in Burrenbridge, Ireland by the same circle of friends who made possible the Walk Out Walk On Deep Dive in Cloughjordan Eco-village. Michael Donnelly, Burrenbridge resident and process facilitator, learned about the Oasis Game via Elos Foundation Netherlands in September 2011. The setting for this game was a small Irish community of just a hundred houses that often relies on surrounding towns for services. Their playground was an open field that had been abandoned for years. The Oasis Game brought together nearly everyone from the community to engage in seven building projects. With the will and energy of all players they: cleaned up the vacant field; built a football field, mountain bike course and natural play area; repaired a shed for a youth hang-out; constructed a potting shed and urban garden; and restored their butterfly garden. Wow! In just two days the space and the community was transformed. Visit our Facebook site to stay updated on events & activities hosted by Walk Outs.